As noted previously, I broke with my usual habit and skipped the Evolution meetings this year. Instead, I attended Botany 2015, a joint meeting of multiple U.S. and Canadian plant-focused scholarly societies held in Edmonton, Alberta — I’d never been to Botany, but I do think of myself as a plant-focused evolutionary biologist, and Jim Leekens-Mack was kind enough to invite me to co-manage a colloquium on intimate mutualisms featuring folks who study specialized plants-pollinators interactions, legume-rhizobium symbiosis, and interactions between plants and endophytes featuring every scientific approach from field experiments to phylogenetics, population genetics to experimental evolution, gas chromatography to computer simulations. That colloquium was a great success, if I do say so myself, and the conference as a whole was fun and informative. Maybe this reflected an infusion of evolutionary biologists who (like me) elected to try out Botany rather than travel to Brazil for Evolution 2015, but I was pleasantly surprised by how much of the science on display addressed more general evolutionary processes, even with the tighter taxonomic focus. There was a lot of hypothesis testing using big phylogenies: Elisabeth Reyes used phylogenetic relationships across 61 angiosperm orders to show that transitions between more generalized radial floral symmetry and more specialized bilaterally symmetrical forms go in both directions. Sally Otto and Sam Scarpino presented back-to-back with contrasting models for the effect of polyploidy on diversification rates — which produced rather different (er, opposite) results. There was also a lot of cool science on species interactions outside of the colloquium on intimate mutualisms. Jeff Doyle gave a beautifully clear presentation laying out alternate hypotheses for the origin of plant-rhizobium symbiosis in the legumes — whether it had evolved once, or more than once — and a plan to test them by searching for “fossil” regulatory regions in the sequences of the plants’ symbiosis genes. Marc-André Selosse explained that plants using symbiotic fungi to parasitize other plants must evolve greater use of fungal resources before they “give up” photosynthesis, using evidence from rare non-photosynthetic “albino” orchid variants. And Jessica Stephens tested the prey capture abilities of carnivorous plants in a common garden to identify different “carnivory syndromes” associated with different, um, diets. Finally, there was good old-fashioned natural history of the sort that I might unfairly associate with a more taxonomically-specific meeting — but which forms the foundation for all the “higher” questions of evolution and ecology. Joey Tanney discussed the painstaking work of connecting DNA sequences from unidentified fungal endophytes, fungi that live inside plant tissue, to known species that aren’t necessarily known from their endophytic phase. Jason Vizelka and Yuliya Sorin each presented some nice basic pollination biology for Mimulus ringens — showing the need for a diverse community of pollinating bees, and the lack of strong self-incompatibility in spite of documented inbreeding depression. 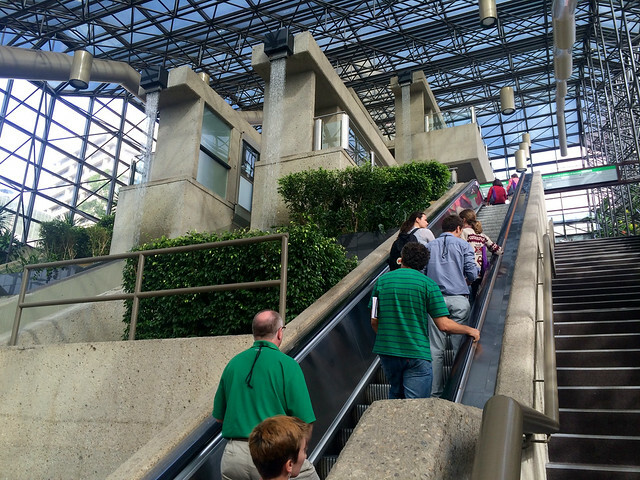 The conference hashtag #Botany2015 was busy on Twitter the whole time I was in Edmonton, which was nice — even though the program was a good deal smaller than I’m used to from Evolution, I often had to choose between simultaneous talks in different sessions, so I it was nice to get updates from around the convention centre. However, Botany hasn’t followed Evolution in taking video of talks, yet — so unfortunately I can’t directly show you any of the presentations I enjoyed. As a closing thought: a large portion of the work I’ve described was informed by DNA sequence data of one sort or another, from the phylogenies to Jeff Doyle’s proposed genomic scavenger hunt to Joey Tanney’s work filling in taxonomic blanks in GenBank. We’re very close to a point, really, where you could almost say that “molecular” is assumed in evolutionary ecology. Not, for the record, that I’m proposing a rebranding of This Fine Blog. Yet. This entry was posted in bioinformatics, conferences, genomics, natural history, phylogenetics, plants, population genetics and tagged Botany 2015. Bookmark the permalink.